Classically trained musicians can play from printed music note for note, but take away that sheet music and they tend to be clueless. Most are perpetually baffled by how jazz musicians are able to invent musical lines in real time with nothing more than a lead sheet as a guide. The most important lesson that I took away from my week with the hot jazz camp is that improvisational jazz is all about musical freedom. 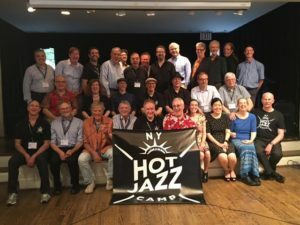 Welcome to the New York Hot Jazz Camp, with trumpeter/vocalist Bria Skonberg and vocalist Molly Ryan. On the first day Nick Russo our band leader gave us some preliminary advice and then handed out sheet music for a 20’s jazz standard called “I’ve Found a New Baby”. He asked the six of us to play it through once from the music (I play clarinet). “This isn’t so hard” I remember thinking after the initial reading – “a little rough around the edges and we didn’t end together, but practice will smooth out the rough spots.” Then Nick dropped a bomb on us: “Now, flip the sheet music over and play it again from memory as best you can. 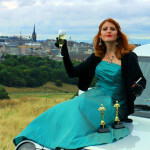 Don’t worry about making mistakes – there are no wrong notes in this building”. In classical ensembles, one wrong note or missed entry invariably evoked an angry stare or verbal reprimand from the conductor and snarky remarks for weeks from the other musicians. In jazz, it’s all about recovery. In the sectional for reeds, Dan Levinson taught us about the various types of endings jazz musicians may choose for a tune (there is no single standard ending): straight through (as originally written), 2-bar tag (repeat the last two bars), the single note hold, the turnaround (a more complex chord progression), the train wreck (to be avoided if at all possible) and my favorite since I work in finance, the Hostile Takeover! This last occurs when the trumpet lead doesn’t seem to know how to end the tune and another musician steps up and assumes the lead. A tip for vocalists: don’t start a song if you don’t know how you’re going to end it. This seems to be a chronic problem with jazz vocalists, not knowing how to end their song. The last day came on Sunday afternoon, May 22nd when the 5 camp bands got to perform at the Iridium Jazz club in NYC. It was the first time many of us had ever played in a proper jazz club and I would be dishonest if I said we weren’t intimidated about our debut. But it went over well and the faculty seemed pleased. 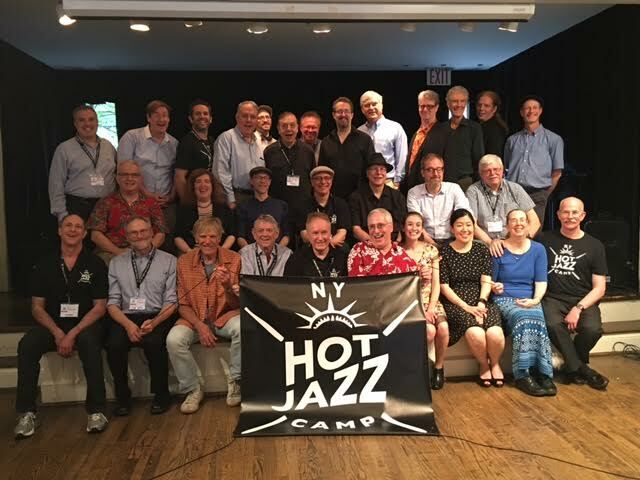 Later that evening at Birdland the NY Hot Jazz Camp faculty gave a final lesson in how it’s done. I had heard all of them play before but there seemed to be a something extra in their playing on this Sunday –I think they too may have been inspired by the intensity of the previous five days. The faculty band simply peeled the paint right off of the walls. It was a riveting hourof very, very hot jazz. I learned that improvisational jazz is about freedom, freedom of expression, freedom from scorn, freedom from the rigidity of printed music. Once released from the classical straightjacket I had been trained in, I found a new voice, a new way to express, and a new way to play with like-minded musicians. 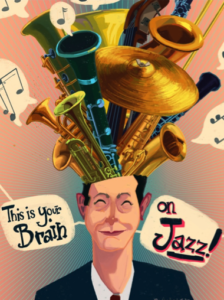 For days after camp ended I experienced a kind of blissful, harmonious state of mind, which was just my brain being high on jazz. Still unable to decide what he wants to be when he grows up, Jon Hill is a quant with a Ph. D. in mathematical genetics, and is an authority on something called model risk management. By night Jon haunts jazz clubs, art museums, theater, cinema—he became an ardent film buff since he saw Federico Fellini’s “8 ½”. Jon lives in New Jersey with two cats and two sports cars.